An Safety Scorecard is a set of leading indicators you can review weekly to track the effectiveness of your company's safety program at a glance. You can use a simple Excel spreadsheet to track these numbers each week against your goal. What are the benefits of a Safety Scorecard? The most important reason to implement a safety scorecard is that what gets measured in your business tends to improve. The exercise of preparing and reporting on your scorecard numbers keeps you and your team on track and accountable for their goals. Another benefit is that by reviewing your leading indicators weekly, you will be able to spot trends and issues in your marketing before they affect your bottom line. When you see a number that is not on track, you can act to correct it before an injury occurs. What metrics should you include? Keep it simple. If you make things too complicated it will be hard to keep the scorecard updated. While you may want to track the number of injuries at your site, keep in mind that by the time an injury happens it's too late to prevent it. For your scorecard, focus on the activities that help keep your employees safe, such as training, inspections, and safety meetings. 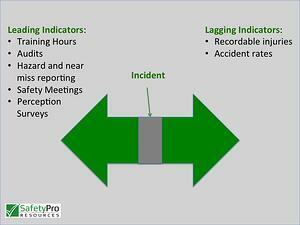 These leading indicators make great numbers to track on your safety scorecard. It's easy to get started by setting up a simple Excel spreadsheet with these metrics. Set up an excel spreadsheet and create a row for each of your safety leading indicators. Next to each item, list which member of your team is accountable for meeting each number. Determine your weekly goal for each number, and include it in each row. Decide who is accountable for preparing the scorecard each week and how that person will get the numbers from each team member. Review your scorecard each week with your safety team. If any numbers are off-track, discuss ideas for getting them on track the next week. Every business is different, so choose the metrics that make sense for your operations. Need help setting up a system like this for your safety department? Contact us for a consultation.